The photos on this and the following pages were taken by Grand Forks resident Mike Kuchar in May 1997, shortly after streets in the Sherlock Park neighborhood were reopened to traffic. The Sherlock Park neighborhood was located just north of downtown East Grand Forks, in a low area between Sherlock Park and the river. Water reached the second floor of many homes here. 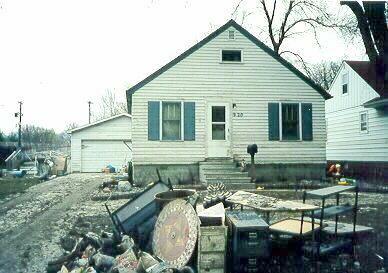 This neighborhood was not rebuilt. 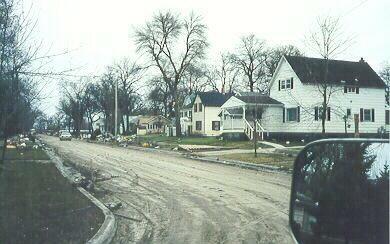 Almost all the homes are gone now. This area may become a campground as part of the Greenway being developed along the river. All photos on this page by Mike Kuchar. 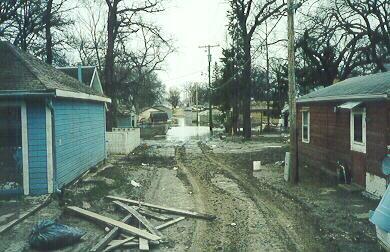 First Street, the street closest to the river. This Sherlock Park alley still had water in May, 1997. River Road at Gateway Drive. 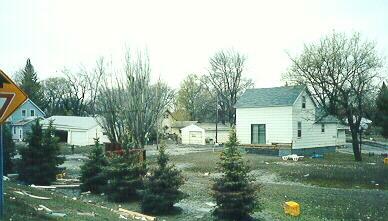 The house and garage at the left are on the home page of this site. 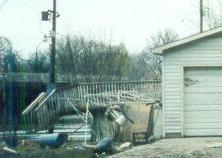 The deck from the house on the right floated across Gateway Drive (see photos below). 920 Third St. The deck from the house in the photo above floated across Gateway Drive and ended up next to this garage. A closeup of the deck that floated across Gateway Drive.